You’re probably getting quite fed-up by the bombardment of articles suggesting you ‘detox’: all those pieces that instruct you to drink only green juice for three days; give up all manner of supposedly ‘toxic’ foods; perform elaborate bath-time rituals to ‘draw the toxins out’; or more worrying, encourage the unlicensed use of laxatives or diuretics.1 Nowadays, there are even commercially processed foods and drinks widely available that label themselves as ‘detox’, suggesting an elixir effect at their heart. The now ubiquitous use of the term ‘detox’ (and the fads surrounding it) become all the more elaborate every year. ‘Detox’ is certainly an appealing concept. For some, it allures to the purification and redemption of an unhealthy lifestyle; a ‘quick-fix’ to undo the late nights and hangovers. For others, the suggestion of weight-loss, clearer skin, shiny hair, all seem good reward for cleansing ourselves. But beyond being an undoubtedly lucrative marketing term, what are these so-called ‘toxins’? Is it actually possible to ‘detox’ at all? Or is it all just an elaborate myth? In more widespread use, the term is now also used to describe the thousands of different substances that get into our bodies, such as pollutants, pesticides, synthetic chemicals, processed foods, heavy metals and more.1 We can be exposed to these from the foods and drinks we consume, but also from the cosmetics or cleaning products we use, and the air we breathe. Some we can control, others we cannot. Global industrialisation and intensive farming has hugely increased the number of chemicals we are exposed to. Unfortunately, the majority of these have not yet been tested for any potential risks or hazards in humans.1 It is therefore hard to know whether they are harmful, or harmless. We also remain uncertain of the potential additive effects there may be from the sheer number of different substances we are exposed to. The bottom line is that there remains a huge amount of uncertainty. However, there is no evidence that average, everyday minimal exposure to these ‘toxins’ should be cause for alarm. Personally, I tend to fall on the more sceptical side and avoid what I can. However, I know many others who prefer to take a more relaxed approach until such a time as they are provided with hard evidence. With sceptical consideration or not, the good news is that our body is incredibly good at ‘detoxifying’ a lot of these chemicals by itself: no crazy diets required! There are lots of complex pathways that happen 24/7 inside us to process the onslaught of chemical substances. In fact, as well as dealing with external ‘toxins’, we are constantly using the same pathways to process normal by-products from our own metabolism, too (8). Detoxification is something that our bodies are very good at, whether we are on a ‘detox’ or not. There is no ‘magic’ bullet supplement, powder, drink or diet that can do this job for us. Don’t believe the spurious claims on packaging that states otherwise. How does it work? The science bit . . .
‘Detox’ within the body is a beautifully orchestrated set of chemical reactions, which get hold of a toxic substance, mix it up a bit, add some tag-on substances to make it safer, and then try to excrete it out of the body. This involves at least 57 different pathways, known as the ‘cytochrome P450’ system. Through all sorts of different reactions, various enzymes involved in this pathway manipulate and transform toxins into different forms, known as ‘intermediary metabolites’. These ‘intermediary’ metabolite’s then go into phase II detox – known as the ‘conjugation’ pathway. Here, various extra compounds are attached (such as glucuronides, sulphates, glutathione or various amino acids). These usually help to make the substance more water-soluble, so it can be excreted into the bile (which then ends up in the stools) or urine. For this last stage, the elimination part, it is generally considered important to have a healthy gut function (do check out my 3 part feature on Gut Health for more info). Does everything go through this process? You are probably now familiar with the idea that ‘detox’ is definitely not a diet, a supplement or a beauty ritual. Nor is it something that you can do one week a year and throw caution to the wind for the other 51 weeks. Your body is ‘detoxing’ all day, every day, so I think it is far better to look at ways we might be able to support these processes. What does this all mean in real life? Also, I don’t think that any concept that encourages us to associate food with sin, contamination, ‘toxicity’ or guilt is helpful. We have to eat, after all, and I worry that ‘detox’ diets, particularly the more extreme ones, not only run the risk of being dangerous, but also potentially set the stage for an increasingly anxiety-provoking relationship with food. Bad news all round. But, rather than just throwing the idea of ‘detox’ completely, we can take a pragmatic approach instead (at least whilst we are waiting for the research to give us more specific answers). I believe that the best course of action is to always follow a sensible, mixed, varied, and whole-foods diet – which also happens to be an otherwise healthy lifestyle and nutrition plan. Win-win! 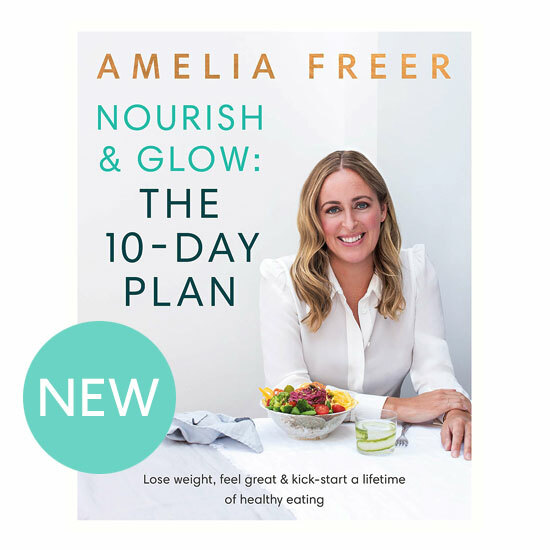 (and handily my new book Nourish & Glow: The 10-Day Plan covers all of this). those that you might want to consider boosting. Before you embark on any radical lifestyle changes, particularly when it comes to supporting your body’s detox processes, it’s a good idea to speak to your doctor first. I hope that this article helps you to better understand what the concept of detox actually means, where the word came from, and how the health industry jumped on it in the first place. I also hope that the information helps you to make better, more consistent choices throughout the year, rather than just a week. Klein, A.V. and Kiat, H. (2014) ‘Detox diets for toxin elimination and weight management: A critical review of the evidence’, Journal of Human Nutrition and Dietetics, 28(6), pp. 675–686. doi: 10.1111/jhn.12286. Genuis, S.J. (2010) ‘Elimination of persistent toxicants from the human body’, Human & Experimental Toxicology, 30(1), pp. 3–18. doi: 10.1177/0960327110368417. Solomon, G.M. and Weiss, P.M. (2002) ‘Chemical contaminants in breast milk: Time trends and regional variability’, Environmental Health Perspectives, 110(6), pp. a339–a347. doi: 10.1289/ehp.021100339. EFSA (2012) ‘Update of the monitoring of levels of dioxins and PCBs in food and feed’, EFSA Journal, 10(7), p. 2832. doi: 10.2903/j.efsa.2012.2832. Schettler, T. (2006) ‘Human exposure to phthalates via consumer products’, International Journal of Andrology, 29(1), pp. 134–139. doi: 10.1111/j.1365-2605.2005.00567.x. Swan, S.H. (2008) ‘Environmental phthalate exposure in relation to reproductive outcomes and other health endpoints in humans’, Environmental Research, 108(2), pp. 177–184. doi: 10.1016/j.envres.2008.08.007. Hodges, R.E. and Minich, D.M. (2015) ‘Modulation of metabolic detoxification pathways using foods and food-derived components: A scientific review with clinical application’, Journal of Nutrition and Metabolism, 2015, pp. 1–23. doi: 10.1155/2015/760689. Cline, J. (2015) ‘Nutritional aspects of detoxification in clinical practice’, Alternative therapies in health and medicine., 21(3), pp. 54–62. Qin, Y.Y., Leung, C.K.M., Leung, A.O.W., Wu, S.C., Zheng, J.S. and Wong, M.H. (2009) ‘Persistent organic pollutants and heavy metals in adipose tissues of patients with uterine leiomyomas and the association of these pollutants with seafood diet, BMI, and age’, Environmental Science and Pollution Research, 17(1), pp. 229–240. doi: 10.1007/s11356-009-0251-0.